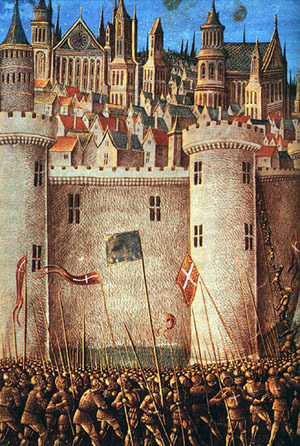 The Siege of Damietta of 1218 was part of the Fifth Crusade. The city, under the control of the Ayyubid Al-Kamil, was besieged by the Crusaders, but the attacking force was repelled. The knights lay siege to the city of Damietta with the aid of a Frisian fleet and a flotilla from the Republic of Genoa under father and son Simone and Pietro Doria. Even after reinforced to 35,000 men however, they were heavily outnumbered by the 70,000 Muslims. In an interesting twist, the Crusaders formed an alliance with Kay Kaus I, Seljuk Sultanate of Rum in Anatolia. Kaus attacks the Ayyubids in Syria so that the Crusaders wouldn't have to fight on two fronts. In June of 1218 the crusaders began their siege of Damietta, and despite resistance from the unprepared sultan Al-Adil, the tower outside the city was taken on August 25. They could not gain Damietta itself, and in the ensuing months diseases killed many of the crusaders, including Robert of Courcon. Al-Adil also died and was succeeded by Al-Kamil. Meanwhile, Honorius III sent Pelagius of Albano to lead the crusade in 1219 . Al-Kamil tried to negotiate peace with the crusaders. He offered to trade Damietta for Jerusalem, but Pelagius would not accept these offers. After hearing this Count William I of Holland left the crusade and sailed home. In August or September, Francis of Assisi arrived in the crusader camp and crossed over to preach to Al-Kamil. By November, the crusaders had worn out the sultan's forces, and were finally able to occupy the port.